Murania Press » A New Magazine from Murania Press! A New Magazine from Murania Press! For some time now I’ve contemplated launching a separate magazine to cover Western movies. I’ve been seriously researching film history for nearly four decades and have devoted more time and effort to the Western than any other genre. (The serial isn’t a genre, it’s a format.) Over the years I’ve amassed gobs of information about horse operas and interviewed dozens of people who helped make them from both sides of the camera. At one time I had a collection of several thousand vintage photographs from Westerns, and though I’ve since sold the whole kit and kaboodle, before doing so I scanned hundreds of stills for possible publication and can access the others at my convenience. Having written one book on Westerns (Filming the West of Zane Grey) and co-edited another (Don Miller’s Hollywood Corral: A Comprehensive B-Western Roundup), I’ve often been asked to lend my expertise, such as it is, to projects covering similar ground. Since 2004, for example, I’ve been editing Lone Pine in the Movies, a magazine published for, and distributed during, the annual Lone Pine Film Festival, which celebrates motion pictures — most of them Westerns — produced in and around that small California community. As a result my “field research” remains ongoing. The recent all-Westerns double issue of Blood ‘n’ Thunder gave me an excuse to include a considerable amount of movie-related material, and it’s actually the foundation on which the first issue of Murania’s new magazine has been built. To be honest, the issuance at this time of Blood ‘n’ Thunder’s Western Movie Roundup has been occasioned by my spur-of-the-moment decision to attend the upcoming Western Film Fair in Winston Salem, North Carolina. It’s the group’s 35th annual convention and will be the first I’ve been to in more than two decades. Originally based in Charlotte, the Western Film Fair previously was a must-attend event for me. In the early years its guest stars included many B-Western stars, including Charles Starrett, Lash LaRue, Sunset Carson, Eddie Dean,and Bob Allen, to name a few off the top of my head. Such perennial horse-opera heavies as Terry Frost and Pierce Lyden were among the regulars, as were former B-Western ingenues Jennifer Holt, Lois January, Peggy Stewart, and Dorothy Gulliver. As the Thirties and Forties stars began dying off, I gradually lost interest in the Charlotte show. Upon moving to Los Angeles in 1992, I gave up on the Film Fair for geographical reasons but followed its progress via reports in movie-hobbyist publications like Classic Images and The Big Reel. The guest lists were increasingly comprised of actors from more recent Western feature films and TV shows. Fascinating people, but none I had much interest in. Over the past several years some old friends in the hobby have been encouraging me to return to the fold, as it were. And even though my plate is full to overflowing at the moment, I actually have a compelling reason to go south this summer, if only briefly. So, with the knowledge that I could kill two birds with one stone, I agreed to attend the 2012 Western Film Fair. But I didn’t see any point in showing up empty-handed. At my urging, BnT art director Chris Kalb quickly assembled this new magazine. I didn’t have time to write anything for it, other than an introductory editorial, so the first issue consists entirely of articles “repurposed” from recent issues of Blood ‘n’ Thunder. I say this up front because I’m not trying to pull a fast one on BnT subscribers and regular readers who might be tempted to buy it. The new magazine will be targeted to Western-film aficionados who, for the most part, have never seen BnT. Subsequent issues will, of course, contain newly written material. I still have in my files many hours of interviews that can be transcribed and lots of original research to mine for articles. In every way Western Movie Roundup will maintain the level of quality readers have come to expect from Blood ‘n’ Thunder. Watch this space for information on ordering and/or subscribing. 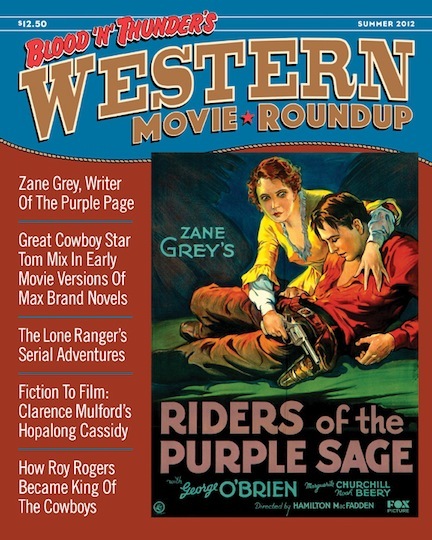 The inaugural issue has just gone to the printer and the Western Film Fair begins a week from Thursday. Once I get past that, I’ll update the site with a page devoted to WMR, as Chris and I call it. Your work sounds fascinating, Don! Keep in touch! Good luck on the new projuct. Am looking forward to meeting you & seeing a copy of this magazine at Winston-Salem.